Tomlins SA, Laxman B, Dhanasekaran SM, Helgeson BE, Cao X, Morris DS, Menon A, Jing X, Cao Q, Han B, Yu J, Wang L, Montie JE, Rubin MA, Pienta KJ, Roulston D, Shah RB, Varambally S, Mehra R, Chinnaiyan AM. Distinct classes of chromosomal rearrangements create oncogenic ETS gene fusions in prostate cancer. 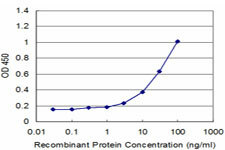 Detection limit for recombinant GST tagged TMPRSS2 is approximately 3ng/ml as a capture antibody. TMPRSS2 polyclonal antibody ( Cat # PAB11593 ) ( 0.1 µg/ml ) staining of human pancreas Lysate ( 35 µg protein in RIPA buffer ). Primary incubation was 1 hour. Detected by chemiluminescence. Western Blot analysis of TMPRSS2 expression in transfected 293T cell line (H00007113-T01) by TMPRSS2 MaxPab polyclonal antibody.Lane 1: TMPRSS2 transfected lysate(53.90 KDa).Lane 2: Non-transfected lysate. Western blot analysis of TMPRSS2 antibody (Center) (AP17792PU-N) in HepG2 cell line lysates (35ug/lane). TMPRSS2 (arrow) was detected using the purified Pab. Western blot analysis of TMPRSS2 antibody (N-term) (AP17793PU-N) in NCI-H460 cell line lysates (35ug/lane). TMPRSS2 (arrow) was detected using the purified Pab. TA305658 (0.1ug/ml) staining of Human Pancreas Lysate (35ug protein in RIPA buffer). Primary incubation was 1 hour. Detected by chemiluminescence.